The dressage freestyle is one of the most exciting parts of dressage. Dressage freestyles, similar to freestyles in figure skating, incorporate compulsory figures into a test choreographed to music specifically chosen by the rider to have a "feeling" they present to the public. Dover explains that "what appears in the end is a totally synchronized dance between rider and horse." These tests are exciting for the public to watch because they often feature popular music and invite the spectator "on a ride for six minutes into a fantasy that the rider is trying to express." For more information about the sport of dressage, please visit the United States Dressage Federation and US Equestrian’s dressage page. 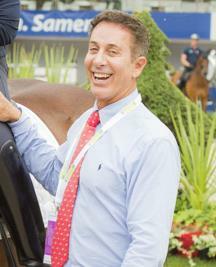 Robert Dover has earned more honors than any other U.S. Dressage rider, competing in six consecutive Olympic Games for the United States, as well as on four FEI World Equestrian Games teams and at seven FEI World Cup Finals. He made his international team debut at the 1984 Los Angeles Olympic Games, finishing in 17th place in the individual competition on Romantico, while the U.S. placed sixth in the team competition. Dover returned to the Olympic Games in 1988 in Seoul, where he finished in 13th place. At the 1992 Barcelona Olympic Games, Dover won his first medal, helping to lead the U.S. to a team bronze medal. In 1994, Dover was named “Male Equestrian of the Year” by the U.S. Olympic Committee after winning the team bronze medal at the FEI World Equestrian Games in The Hague and finishing fifth individually. At the 1996 Atlanta Olympic Games, he won his second Olympic medal when the U.S. finished in third place to win the team bronze medal for the second straight time. He has also taught clinics all over the world, sat on many USEF committees, and is one of the founders of the Equestrian Aid Foundation, which helps people in the horse world suffering from any life-threatening illness or injury. Since being named the U.S. Dressage Chef d'Equipe/Technical Advisor in 2013, Dover led the U.S. team to a team gold medal at the 2015 Pan American Games and a team bronze medal at the Rio 2016 Olympic Games. Photo of Robert by Shannon Brinkman.